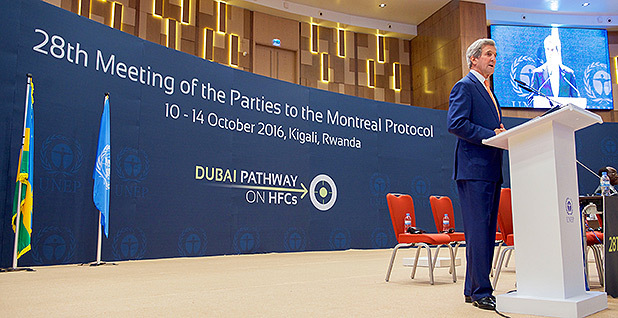 Then-Secretary of State John Kerry delivers remarks about the Montreal Protocol in Kigali, Rwanda, last fall. Photo by U.S. Department of State, courtesy of Flickr. The Trump Justice Department defended an Obama administration rule today for phasing out potent heat-trapping chemicals. Two manufacturers of the chemicals, hydrofluorocarbons, have asked the U.S. Court of Appeals for the District of Columbia Circuit to kill the rule. President Obama's 2013 Climate Action Plan called for cutting HFC use at home and abroad. The 2015 U.S. EPA regulation at issue eliminated some uses for HFCs, which were previously accepted as alternatives to ozone-depleting substances, and approved substitutes for the chemicals. "This isn't a stretch of the statute," DOJ's Dustin Maghamfar told a three-judge panel in the D.C. Circuit. Judge Brett Kavanaugh appeared to side with the companies at times, saying EPA's rule would force firms that switched from ozone-depleting substances to HFCs to "spend a lot more money." EPA's regulation — and a similar rule last year phasing out other uses of HFCs — was issued in the runup to the October international agreement to amend the Montreal Protocol to phase down HFCs globally. The Trump administration has broadly pledged to undo Obama climate regulations. But while there are concerns with specific rules to eliminate HFCs, global efforts to phase down the chemicals have industry support. Industry leaders want Congress to ratify the Montreal Protocol amendment and are worried the deal will get caught up in the politics of climate change (Greenwire, Jan. 12). Two U.S.-headquartered companies that produce alternatives to HFCs are backing EPA in the lawsuit. The companies — DuPont spinoff Chemours Co. and Honeywell International Inc. — and the Natural Resources Defense Council intervened in the case on the agency's behalf. Chemours and Honeywell have "invested hundreds of millions of dollars" in replacements, said Thomas Lorenzen, a partner at Crowell & Moring and a former DOJ attorney who represents the companies. "This is significant to them, too." The legal question in the lawsuit is whether EPA can use the Significant New Alternatives Policy (SNAP), which is geared toward phasing out ozone-depleting substances, to replace HFCs. EPA first issued its SNAP regulations in 1994, listing HFCs as acceptable replacements for ozone-depleting substances like chlorofluorocarbons. Since that rule took effect, HFC demand has increased dramatically, thanks in part to growing demand for refrigeration and air conditioning in developing countries. With increased demand has come awareness of HFCs as potent greenhouse gases, leading to President Obama's inclusion of HFC cuts in his 2013 plan to address climate change. The EPA rule in 2015 effectively banned 38 individual HFCs or HFC blends in 25 uses in four industrial sectors: aerosols, air conditioning for new cars, retail food refrigeration and foam blowing. In their lawsuit, Mexico-based Mexichem Fluor Inc. and France-based Arkema SA argue EPA can't use SNAP to limit substances that themselves do not deplete ozone. The SNAP program, they argue, can only be used to replace ozone-depleting substances — not previously approved replacements for those substances. Once industrial sectors have moved away from ozone-depleting substances, "the SNAP program no longer has any work to do," said Dan Himmelfarb, a partner at Mayer Brown who is representing Mexichem. "EPA has turned a limited program into a limitless one," he told judges. The Justice Department maintained that EPA has authority to revisit its list of replacements for ozone-depleting substances. The rule is lawful, the agency argues, because HFCs pose an overall risk to humans and the environment due to their effects on climate change. And the Clean Air Act, DOJ's Maghamfar told the judges, says it's illegal for EPA to replace ozone-depleting substances with substitutes that may adversely affect human and environmental health. "The statute requires EPA to compare alternatives to each other," Maghamfar said. But Kavanaugh, a George W. Bush appointee, said that while the statute does seem to give EPA authority to decide that "some substitutes are OK and some are not OK," the agency's 2015 rule "does seem to pull the rug out" from under companies that invested in HFCs. "I guess I'm still stuck," he said. "Maybe I'm unique in seeing the problem that I'm seeing." Like Kavanaugh, Judge Robert Wilkins, an Obama appointee, questioned what promises EPA made to companies in its 1994 regulations about potential updates to the list of accepted alternatives. But Wilkins said a petition process that Congress established "wouldn't make sense" if lawmakers didn't expect EPA to update the list in the future. Maghamfar argued the agency was clear in its 1994 regulations that it may make changes to the list of accepted substitutes in the future. "We are not promising that once you're on the acceptable list, you get to stay there forever," he said. Judge Janice Rogers Brown, a Bush appointee, heard the case with Kavanaugh and Wilkins. The judges will likely issue a decision in the coming months. Mexichem is a member of the Air-Conditioning, Heating & Refrigeration Institute, the major trade group for the heating and cooling industry. A spokesman said the group had its eye on the case. "We are watching this case closely as it involves one of our member companies and an issue — refrigerants and the SNAP program — we care a lot about," said Francis Dietz, the spokesman. "We did not intervene in the case but are paying close attention to how it plays out." The ruling will likely affect a pending lawsuit in the D.C. Circuit over EPA's 2016 HFC rule brought by the National Environmental Development Association's Clean Air Project. The Natural Resources Defense Council, Chemours and Honeywell are also seeking to intervene in that case on behalf of EPA.